Head and neck cancer refers to malignancies of the oral cavity, pharynx, larynx, paranasal sinuses, nasal cavity or salivary glands. Over 90% derive from squamous cell epithelium, hence are often collectively referred to as Head and Neck Squamous Cell Carcinomas (HNSCCs). Most HNSCCs are linked to modifiable behaviours, with alcohol and tobacco use account for around 75% of HNSCCs. Other risk factors include HPV (mainly type 16, most significantly linked to oropharyngeal cancer), betel quid (linked to oral cancer), occupational wood dust exposure (linked to sinonasal cancer), and EBV infection (linked to nasopharyngeal cancer). Many HNSCCs, typically the oral cancers, may begin as a visible premalignant condition, such as leukoplakia (white patches), erythroplakia (red patches), erythroleukoplakia (mixed red and white patches), oral lichen planus, or actinic cheilitis. These premalignant conditions are also heavily associated with smoking and alcohol consumption, and have a lifetime risk of transformation ranging from 0-20%. Consequently, most suspected premalignant conditions require further histological assessment in the form of a biopsy. Each subtype of HNSCCs can present differently, however it is important to remember non-specific cancer symptoms, such as weight loss and cervical lymphadenopathy, can also be a feature. Most commonly oral cavity cancers will present as a mass, typically painless, being felt on the inner lip, tongue, floor of the mouth, or hard palate. Less commonly, these cancers will present in more non-specific means*, such as oral cavity bleeding, localised pain within the oral cavity, or jaw swelling. Many cases of pharyngeal cancer can present* initially as odynophagia, dysphagia, stertor, or referred otalgia. Nasopharyngeal carcinoma patients can present initially with a neck lump. Majority of these tumours, specifically of the hypopharynx, frequently will have an advanced stage at the time of diagnosis as they will often metastasise early due to the extensive lymphatic network. 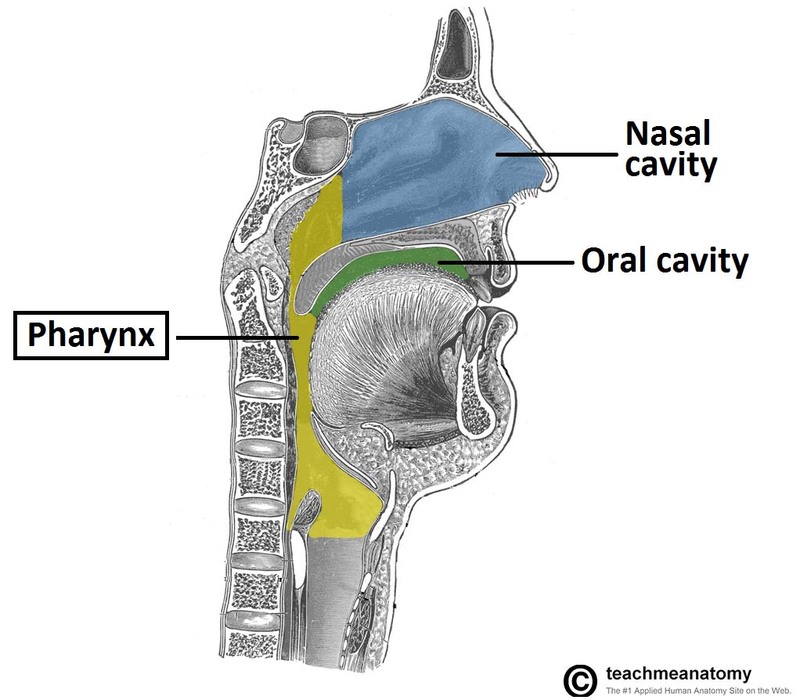 The clinical features of a laryngeal malignancy can include hoarse voice, stridor (if advanced), dysphagia, persistent cough, or referred otalgia. Laryngeal cancers are divided anatomically (mainly for the purpose of tumour staging) into glottis, supraglottis, and subglottis, with most malignancies originating in the glottis region. Patients with glottic tumours have better prognosis as they present earlier with hoarse voice and there is no lymphatic drainage from the glottis, hence limits any metastatic spread locally. The mainstay of investigation for suspected HNSCC requires biopsy of the lesion, the method by which this is obtained depends on the location. For those patients presenting solely with lymphadenopathy, they will undergo ultrasound-guided fine needle aspiration (FNA) to assess for evidence of malignant cells. Any suspected lesion will typically have a CT scan of the neck and chest used to estimate tumour extension, evidence of local invasion, and any cervical lymphadenopathy. The chest is included for staging to assess for any lung metastasis. PET CT scan is occasionally used for tumours of unknown origin. An MRI scan is superior in assessing oral cavity and oropharyngeal lesions, hence in these patients, they will undergo MRI neck and CT chest scans separately to stage the disease. Management of HNSCCs varies greatly depending on the location, size, stage, and grade of the cancer, as well as patient preference and co-morbidities. Surgical resection +/- adjuvant radiotherapy or chemotherapy or primary radiotherapy +/- adjuvant chemotherapy are the mainstays of treatment for most HNSCCs. Surgical management of HNSCC is complex and dependent on a variety of factors. The management plan is discussed in a dedicated head and neck MDT meeting. Table 1 – Recurrence Free Survival Rates for Head and Neck Cancers, data adapted from Iro H et al. A proportion of those treated for head and neck cancers will develop secondary primary malignancies, with rates at 20 years ranging from 9-23%, hence can have an impact on long-term survival after successful treatment of early-stage HNSCC. Which HPV type is associated with HNSCC? Which of the following is seen as a premalignant condition to HNSCC? Which of the following is not part of NICE guidance regarding referral to a specialist centre for suspected HNSCC? What is the rate of developing a secondary malignancy following treatment non-surgical managements?